Imagine a peaceful evening somewhere in Acadia, maybe deep among the trees, overlooking a still pond, or catching the last rays of sun on a seaside ledge. You hear a light wind in the trees, maybe a few birds calling, or a stream running over moss-covered stones. The sun sets and stars come out, uncountable spangles in the velvety blackness overhead. Far-sighted park founders knew that, although the communities of Mount Desert Island, Schoodic, and Isle au Haut are a special part of the area’s appeal, unchecked private development would threaten this sort of natural experience. 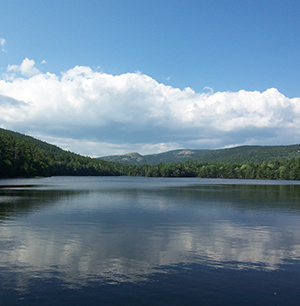 So they began the legacy of conservation that gave us Acadia National Park. That work continues today. Privately-held lands within Acadia’s boundary or in sensitive areas along its borders threaten the natural soundscapes, vistas, habitats, and dark night skies that contribute to the magic of the visitor experience. The Acadia Land Legacy program is a partnership of Friends of Acadia, Maine Coast Heritage trust (MCHT), and private philanthropists to purchase threatened lands in and adjacent to Acadia and hold them until the park is able to acquire them through Land and Water Conservation Fund (LWCF) appropriations. Recent achievements of the partnership include the purchase of 37 acres on Lower Hadlock Pond and the purchase of a conservation easement that has ultimately led to the incorporation of 1,400 privately-owned acres of intact woods and wetland into Acadia’s Schoodic District. Contact your Congressional delegates and ask them to support full funding for the Land and Water Conservation Fund, which will allow Acadia to purchase protected lands from Acadia Land Legacy partners as intended, freeing up funds for the partnership to purchase remaining land parcels as they come on the market. If your delegates have supported LWCF funding in the past, thank them for it.